Wedding and Honeymoon programs at Sol Cayo Guillermo hotel. The 4-star All-Inclusive Sol Cayo Guillermo hotel has designed several programs so that lovers can make their Wedding and Honeymoon a wonderful dream come true. 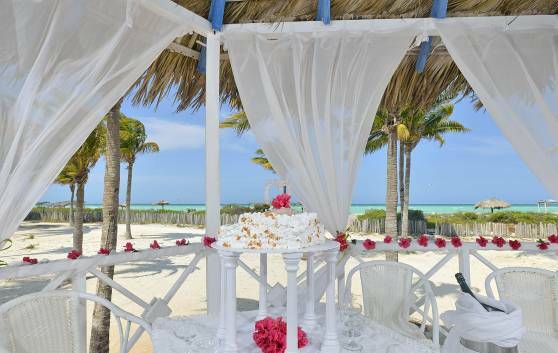 The Free Wedding, Wedding a la Carte, Renewal of Vows and Free Honeymoon programs will make these special moments a memorable event in romantic Cayo Guillermo, beach wedding destination. Sol Cayo Guillermo hotel will take care of all the wedding planning: invitation, party, flower, music, decoration, reception and photos, after a minimum number of requirements according to the market have been met. The hotel also offers honeymoon packages and romantic getaways with exciting added values. &quot;Just Married&quot; sign on the door. Express Check-In guaranteed - Personalized Check-In. Special Wedding Desk at the Public Relations Department. Your “Something Different” celebration dinner for two.